Life is moving forward here, little by little. My son’s kindergarten year is going well. Last year Charlie was in a private kindergarten on a farm. Public kindergarten has been an education for him in many ways. He does say, “I don’t like school,” a lot. It’s tough to hear, but we don’t have a choice — he’s going to this school and it’s a good one. Last year on the farm was a special experience. It was a group of eight and most of what they did was experiential. Charlie made some progress with his reading and writing, but the year was mostly focused on social learning. At the end of the year he won the “Hugs and Kisses” award because he was so affectionate with his teacher and his classmates. This year I know he has gotten in trouble for talking. His class is just 15 kids, which is a nice intro to the public setting. He likes his teacher, but he doesn’t like the work. I know that he feels pushed, but his reading and writing skills are just speeding along. His math ability is well above average and the teacher has been able to offer him some tough stuff. It’s great to see him blossom in new ways this year, even though it hasn’t been perfect. In a previous blog post, I mentioned that Charlie had taken an interest in eating the breakfast at school, even though it wasn’t gluten free. I gritted my teeth and let him have a little independence. I don’t think gluten works for Charlie, but he doesn’t have a formal diagnosis of Celiac’s disease. I’m totally gluten free and when I’ve eaten gluten through cross-contamination (eating “gluten free” at a restaurant and having the food be prepared in such a way that it comes in contact with gluten), I’ve been sick. But Charlie doesn’t get sick like me. So, at minimum, a little gluten doesn’t seem to effect him. That being said, he only gets gluten in special Chinese foods about once a month or in those accidental situations. Well, after a few weeks, Charlie lost interest in the breakfast program at school. I admit that I was relieved. Because I’m not able to be at Charlie’s school, I can’t see what is served. Frankly, I’m just happy that he’s not eating gluten at school. Since I’m not in the cafeteria and I can only gain so much information from the monthly menus that are sent home, I don’t know what the kids are eating at my son’s school. 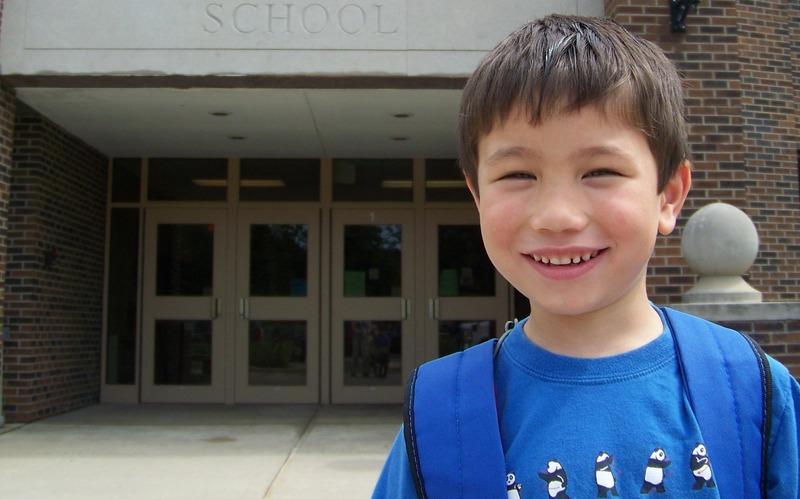 He’s in half-day kindergarten and eats the lunches I pack outside of the school as part of his care program. However, I am aware of the school’s rules on party and snack food and they are strict. Kids can only eat snacks that are vegetables, fruit, or cheese (Other schools in our district only allow veggies and fruit so the cheese is a bonus for us, I guess). Additionally, only water in the classroom — no gatorade or juice. No cupcakes, no cookies, no sugar. The rationale for the food policy is not to avoid obesity. From what I have gathered, the strict rules are because of food allergies. The school wants to avoid any accidental exposures and I respect that. After sending cheese sticks with my son for weeks, he stopped eating them after awhile. They probably were warm — yuck! Then I started sending baby carrots, but he just didn’t eat them. So I stopped sending a snack because the truth is that he doesn’t even need a snack. His birthday came and went and I didn’t send a thing with him to school. He didn’t complain about not having anything because no one gets cupcakes at school. I didn’t even send goodie bags with cheap plastic junk. I could have even sent pencils, but I didn’t. That weekend I held a birthday party for him at the bowling alley and I decided that the party was enough — I didn’t need to give goodie bags to each kid afterwards. I know what happens with the goodie bags of cheap trinkets made in China that we get after the parties Charlie goes to: the junk ends up rolling around our house until I just toss them in the garbage when Charie’s not looking. My light bulb moment was that other parents would probably appreciate not receiving goodie bags. The take-away for any school food activists reading would be to emphasize severe food allergies when revising school snack policy. They don’t pan peanut butter at lunch, but they do have a “peanut free” table. Our neighbor’s son goes to the same school as my son and he is tactically allergic to peanuts. That means that if he simply *touches* peanut butter, he might have a deadly anaphylactic reaction. As a parent and an educator, this terrifies me. He could just high five someone who had peanut butter on toast for breakfast and need to use an epi-pen. A veggie/fruit/cheese snack policy is wise indeed. Is a meal a piece of toast gobbled down while driving to work? Is a meal a replacement shake popped open and drunk at an office desk? 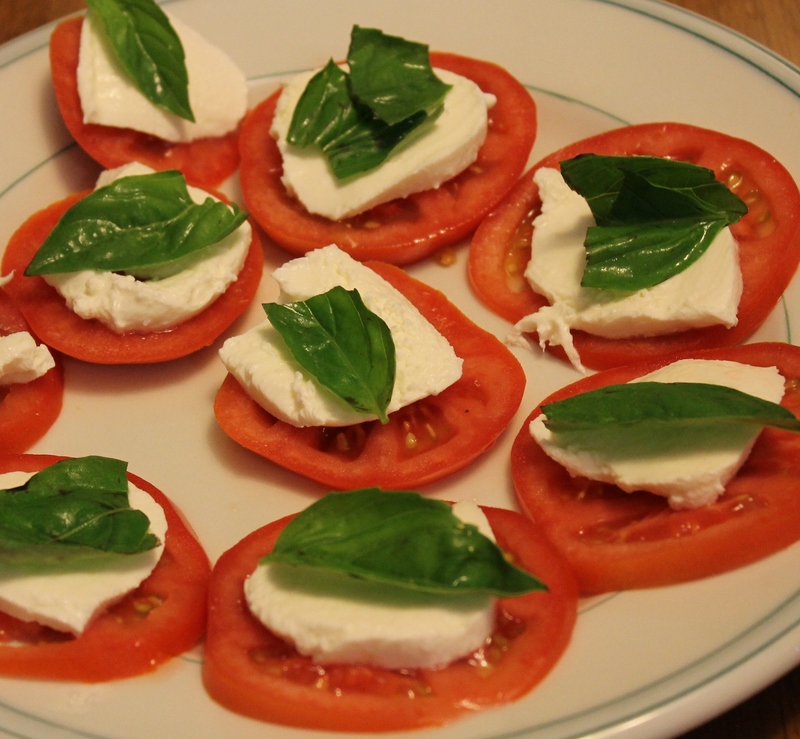 Is a meal a simple summer snack of a fresh tomato, mozzarella slice, and one basil leaf? Is a meal an apple eaten during a 15 minute break in the back room of the Gap? Is a meal a bowl of cereal slurped down at dinnertime in front of the TV? Is a meal a bowl of popcorn at a movie?